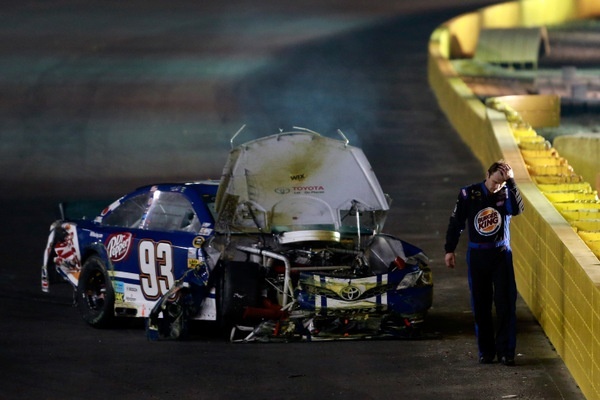 It was a madhouse Sunday night at Charlotte Motor Speedway, with an increasingly bizarre turn of events that created one of the weirdest nights of racing in quite some time on the NASCAR tour. Kevin Harvick wound up winning, almost by being the last man standing, in a night of brutal action, over Kasey Kahne and Kurt Busch. The winning move came during a yellow, for debris, with only 16 laps left in the 400-lapper, well over five hours after the 6:23 p.m. ET start, under brilliant, warm spring skies. The move was simple -- crew chief Gil Martin, as at Richmond earlier this month, calling Harvick to pit road for two fresh tires, though giving up second spot on the track. Kahne, the leader at that point, didn't pit, feeling he could hold track position the last 12 laps of the race, even though his tires had some 30 miles on them. Harvick got a good start, quickly took the lead, and Kahne couldn't fight back to his rear bumper. But the action on the track and Harvick's win and Kahne's loss and Kurt Busch's bitter disappointment weren't the heart of the story of the night. Rather the heart of this story was the wildly chaotic atmosphere of the race, which enveloped drivers like some heavy fog, dragging them from one disaster into the next. As the nightcap event to a day long of racing, starting with the Grand Prix of Monaco, and then continuing with one of the most emotional and exciting Indy 500s ever, this Coke 600 was, well, like one of the heavyweight boxing showdowns where they simply pummel the hell out of each other. The 600 turned again and again -- not because of great racing, because there really wasn't much of that, but rather because of the wild sequence of events, which left drivers and fans dazed, even confused at times. The incident that seemed to trigger the bizarreness was the failure of one of Fox TV's high-wire moving cameras. The camera itself didn't fall down (two years ago, in a similar incident, such a camera did fall on a football playing field), but one of the half-mile long nylon transport cables collapsed on to the track itself. 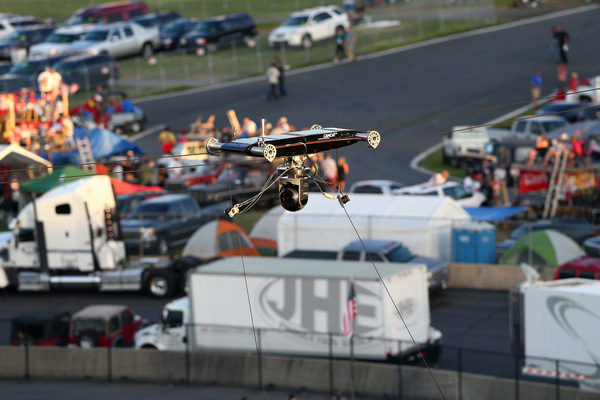 That cable entangle race cars, which hit it at 195 mph, and the cable injured at least 10 fans. Kahne was stunned at the cable collapsing: "I came off turn four and saw it wrapped around Kyle's car. Then it hit mine. "I thought I had to be seeing things. There was no way there could be a cable on the race track. "But by the time we got to turn one, I saw it again. And I saw Kyle's fender and the side of his car go down (ripped open by the cable). I've never seen anything like that. "Then we went down the backstretch and when we came back around people were still hitting it. "I was definitely surprised there wasn't a caution any quicker, for something like that." 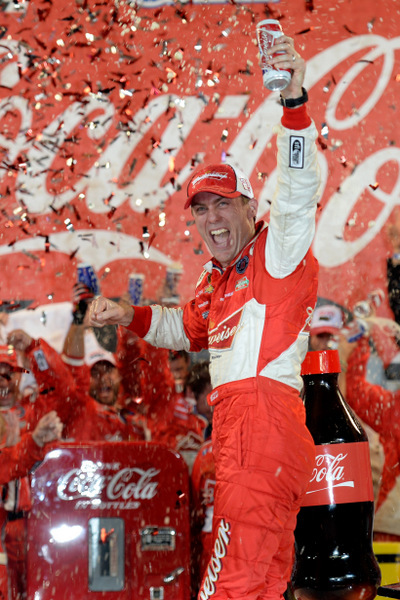 "The first time I went by I said 'Well, I guess my career is over, because my eyes are taking a crap,'" Harvick said with a laugh. "I was hoping this wasn't my last race. I was looking for that black thing laying across the track the next time by, and there it was. "This is one of the night you going into knowing you're just going to have to grind it out and keep yourself in position." Harvick didn't have the best car on the track, by far. But it was a night of survival, and he and Martin were the best at that. The race started with four men head-and-shoulders above the rest: Kahne, Matt Kenseth, Kyle Busch and Kurt Busch. Jimmie Johnson was trying to charge into contention late but crashed with 70 laps to go, taking out Kenseth. That was just one of many almost surreal moments. Harvick's first words in victory lane: "I hope everybody is okay from that cable. That was a weird incident. "Gil made a great call at the end. And we were able to survive until it was time to go at the end." "We had 12 different scenarios we were trying to play out," Gil Martin said. "I thought coming for tires was a no-brainer. And it worked out good." Kahne had one of the cars to beat, and knew it: "It was definitely our race to lose. "We thought some guys would stay out, and we could get away. But that didn't happen; they all pitted. "I knew Kevin would be good. We raced all day, and I thought we were in good position, but at the end we didn't get it done." While Kahne was disappointed, not nearly as much as Kurt Busch, who showed hard, mixed emotions. Again Busch had a car that was easily strong enough to win....and yet didn't. 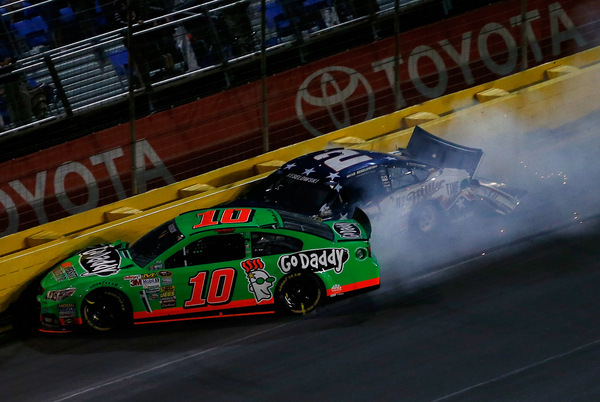 Busch was leading late, with a little over 100 miles to go in the 600-miler, when Danica Patrick and Brad Keselowski crashed hard. 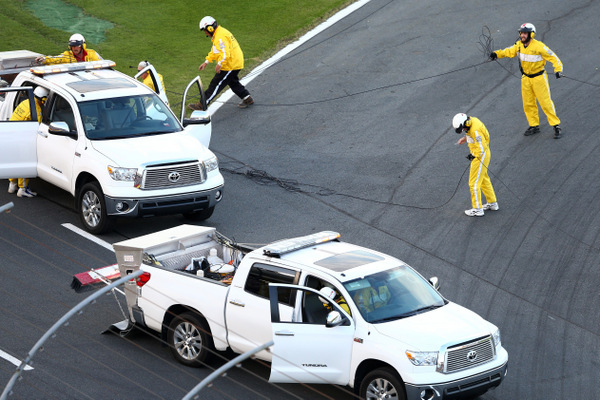 NASCAR held the field while cleaning up the debris. But during that pause Busch's engine went dead, with battery trouble. Busch needed a push from a wrecker to get a jump start and he fell to 15th as he headed to pit road for his crew to replace the battery. Busch charged hard back into contention. "It's still a tough slog. We got the lead...and then the battery went dead. I don't know what to think about that. 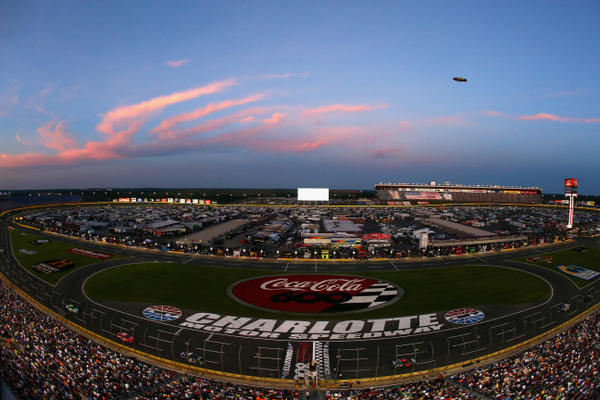 A high-wire TV camera cable snapped midway through Sunday night's Coca Cola 600, in a bizarre failure, dropping the nylon cable onto the track at Charlotte Motor Speedway. Several cars ran over the cable and suffered significant damage, and track officials reported 10 fans were injured in the incident. Three of those fans were taken to a local hospital with unnamed injuries; seven were treated at the track. The cable is used by Fox for a fast-moving camera high above the race track, a camera that can travel much of the front straight. NASCAR red-flagged the race for about 30 minutes while dealing with the highly unusual situation. Usually teams are not allowed to work on their cars during red flags, but NASCAR waved that rule this time and gave them 15 minutes to repair any damage. "At this time, we do not have a cause for the failure of the camera drive line that interrupted tonight's Coca Cola 600 at Charlotte Motor Speedway, and our immediate concern is with the injured fans. "The camera system consists of three ropes -- a drive rope which moves the camera back and forth, and two guide ropes on either side. The drive rope failed near the Turn 1 connection and fell to the track. The camera itself did not come down because guide ropes acted as designed. A full investigation is planned, and use of the camera is suspended indefinitely. "This camera system had been used successfully at this year's Daytona 500, last week's NASCAR Sprint All-Star Race and other major events around the world. We certainly regret that the system failure affected tonight's event, we apologize to the racers whose cars were damaged, and our immediate concern is for the race fans. We also offer a sincere 'thank you' to the staff at CMS for attending to the injuries and keeping us informed on this developing situation. "When we have more information on the cause of the equipment failure, we will share it with you immediately." Submitted by Bill Reeves on Sun 05/26/2013 - 19:07. I hope those injured recover quickly. New technology has its glitches. Hopefully it is engineered to not do that again. Submitted by lynn phillips on Mon 05/27/2013 - 08:33. Just another reason to stay away!!! If they don't slow the cup cars down and create better racing you will just see more empty seats. Very SAD!!! The new cars don't race as good as last season's cars!!!! Submitted by gary on Mon 05/27/2013 - 09:53. Submitted by wizard of id on Mon 05/27/2013 - 11:47. The cars are too fast nascar. They have been for 10 yrs. The answer is not in the new car. The answer is not in fuel injection from 1971. The answer is in the heads and valve springs. Limit that back to about half of what teams can run now. Limit the head and valve springs and you can also do away with the plate. simply done and cost efficient. On another note why in the hell is nascar promoting danica beside the king in there nascar commercials.Petty is the king and always will be and danica is a novelty act like a weird circus show. Nascar stop it!!!!!!!!! she has won nothing and never will so stop trying to say she's one of the stars. The 600 was another snooze fest except for the weird chain of events.Dover will probably be the same way, as will the rest of the season. until nascar does something to slow the cars down to make better racing it's not going to get better just worse. Nascar, get your head out of your arse and address the real issues and quit trying to make danica a living legend.You do realize you are making the sport look stupid by doing so don't you.It's like the nfl trying to make the waterboy the star, golf giving the green jacket to the caddy, or baseball letting the batboy bat clean up. Let me say this i'm a huge Dale Jarrett fan but in no way does waltrip, wallace or jarrett belong in the hall of fame yet. There are too many deserving people who should have been inducted far ahead of them. 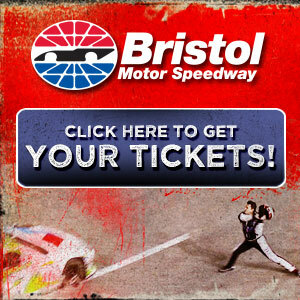 will drivers who gave it everything they had, such as buddy arrington, dave marcis, wendell scott, jd, elmo langley and others ever have a shot at getting in? No they didn't win championships but they helped shape nascar into what it was. Submitted by Gina on Mon 05/27/2013 - 14:29. I got home just in time to see Gordon get caught in the Martin/Amirola wreck. Glad that I had fun doing something else before I got home and saw the race. Happy for Harvick, sad for Gordon that once again, decisions made on pit road cost him a decent finish.